Feeling a bit hopeless right now. I haven’t posted about all the recent politics because I can’t think how to articulate my incredulity in any way that hasn’t been written a thousand times already. Brexit was bad enough… Trump is just unbelievable. Carl and I sat up watching the US election (alternating between BBC, CBC and Twitter, for ‘balance’) until it was clear that Hillary was not going to win; it was about 1am when we finally gave up and went to bed despairing of the world. At the time I was angry and raging sarcastically online, but the next day I seemed to get a sort of political hangover. I didn’t want to do anything, couldn’t face going online in case there were still Trumpanzees on my Twitter feed, but couldn’t summon the motivation to go out and do anything else. I met up with friends and took the kids to the park and it seemed like we all felt the same, just numbed by the whole thing. I can’t blame this entire malaise on Trump though. I am in a low spot for lots of reasons right now – maybe it’s the weather? (For the record, no snow yet..). It’s all about Uncertainty and not being in control of various aspects of my life at the moment, and I am never very good at handling that. My ‘maternity leave’ (not that I actually took any) officially finished 6 months ago, and since then, I have had some actual leave in that I haven’t been doing any work that warrants a salary. Strangely enough, this isn’t sustainable for very much longer, as we are living paycheque-to-paycheque and struggling. Theia will be 18 months old at the end of January, which means she can go to daycare then, IF we can afford it, and IF I have a job that requires childcare. That is extremely difficult to engineer though, because I not only have to find a job, I have to find a job at a time that coincides with when the daycare has space for her, AND that job has to pay me enough to make it worth me paying the daycare fees for. This isn’t as hopeless as it was in the UK when I found myself in the same position with Miranda – even a full-time minimum wage job here would net enough to cover daycare costs and spare me about $500 a month – which would certainly help right now. (As opposed to the UK where full time daycare would have cost me more than my entire month’s salary after tax) But, I like to believe I am an adult now, I shouldn’t really be looking at minimum wage positions, and I don’t want to go to work just to have half to two-thirds of my earnings go towards paying someone else to raise my child. To this end, I have applied for ten other “grown up” jobs, most of which I think I would actually enjoy doing too, and all of which, on paper at least, I had the qualifications for. I haven’t heard back from a single one of them. I can blame the economy or the time of year, but I think a large part of it is my resume. It must be fairly obvious that I don’t know what I want to do with myself, and I honestly don’t right now, but that is not the same thing as saying ‘I DON’T want to work’, I just don’t know what work I want to do! Also, I am back to the overqualified problem. Turns out, the only thing worse than putting “obscure Arts PhD” on your resume, is putting “nearly a decade of self-employment” (NB: I am paraphrasing here). Once an entrepreneur, always an entrepreneur… but one who still has to pay the bills. Through the cafe in its various forms, and Wheelie Good Coffee on the market, I have basically put myself through an MBA only without the certificate at the end. At risk of immodesty, building a business from scratch with no money in a country you’ve only lived in for 2 years really takes some doing: it’s all problem-solving, multi-tasking, design, research, fundraising, communications, networking, social media, marketing, leadership skills, HR, business development, even financial wizardry (YOU GUYS I DID A BUSINESS TAX RETURN ALL BY MYSELF!!!) I guess the trick is to make it look like I can apply all these skills to things other than coffee. I know I’m capable, but there’s a fair chance prospective employers will just give preference to someone with more direct experience. In an ideal world I’d pick it up and move the whole endeavor to a better and cheaper location. And I would love to try and incorporate a bookshop. But I need the funds to do that, and I don’t have them. Even if I can raise some investment somehow, I lack the confidence now to know if I should even be considering this as an option. Is it too much of a financial risk, and should I concentrate on finding an actual employer instead? Somehow, all of this is so stressful that I haven’t got the mental energy to make that decision, let alone get on with doing something about it. I am exhausted. Also, I wrote a book. An actual, 70,000 word, non-silly, zombie-free memoir sort of thing about coffee and about the whole entrepreneurial experience. For once, I’ve taken my writing seriously enough to have planned out a structure and storyline, and I don’t hate what I wrote! I have spent this year’s Nanowrimo trying to edit it properly. I even approached a couple of publishers and wrote a proper book proposal. Unfortunately, the publishers’ websites say things like “Please allow six months for a response”. So I don’t know whether its worth prioritising the editing over fruitless job-hunting when I get fed up, in the event that it gets rejected over and over and over after months of waiting. So. The end of the year is looming, and the future is highly uncertain. I am lost, and in need of inspiration, something to boost me in the right direction again. I don’t often give my dreams much thought, other than when helpful friends point out the screamingly obvious – teeth falling out dreams meaning insecurity and so on. (Thanks Andie!) However, I think recurring patterns and one very vivid recent dream have some poignancy. The other night I dreamt about riding a motorbike. I did used to ride, but never got my full license. In the dream, I knew it had been a long time but that I could ride if I tried hard. Except for some reason, I was chasing something down a hill on a huge yellow motorcycle, whilst wearing my yellow Doc Marten boots but I was sat on the bike the wrong way. My feet could just reach the pedal, but I couldn’t really see where I was going. Yet, I was swerving around successfully and just about navigating, but I did not feel at all safe. Someone else passed me on a bike also wearing yellow boots and I knew I could catch them up if only I could turn round and see the road, but I couldn’t. And I still didn’t know what it was I was supposed to be chasing. An odd metaphor for my present situation, I believe. I know I can make this business work, I have done so before, but I am out of practice, and there are various factors outside of my control. I have to go on despite not being able to see where it is all headed, and I am also consciously aware of competition – the folks who are sat on the bike the right way round! A quick google reveals that yellow is the colour of intellectual design and of awareness and identity. Make of this what you will, dear reader. Every single bit of me aches. BUT THE COFFEE SHOP IS OPEN!! We are back to 13s again. I left the Sensible Office Job on Friday 13th Feb, and today, 13th April, we opened the doors officially! So, I have only been working on this full time for two months. I’ve already blogged about the mysterious recurrence of thirteens in Canada – arriving during the year of our thirteenth anniversary, Miranda’s date of birth, and at the time, living on 13th Ave and working at 13th Ave coffee shop. 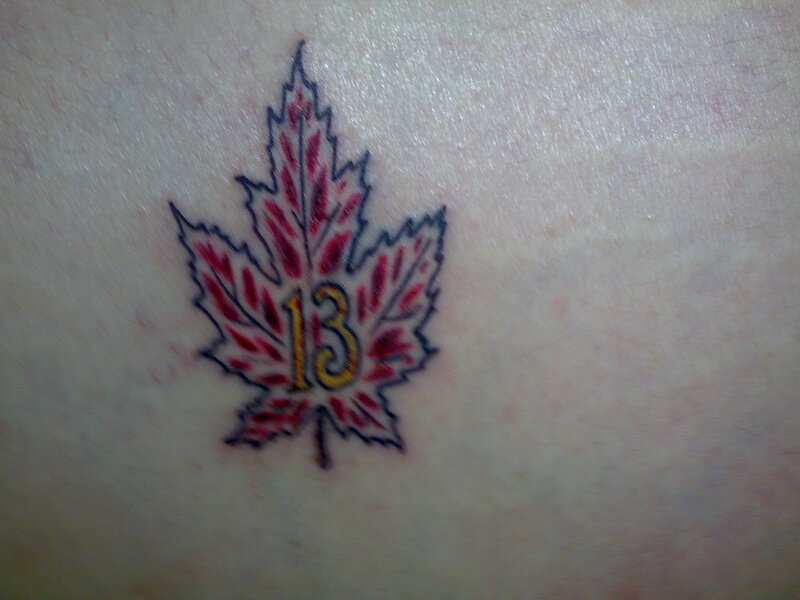 Actually, if I remain pragmatic, none of that is anything other than coincidence or deliberate design; really I am trying to justify the significance of my 13 tattoo!! Including tackling a few social media explosions and replying to the daily onslaught of emails in the evenings, I am putting in 13 hour days as well. This is to be expected, especially in early days, but I had forgotten how tiring being on your feet all day is, compared with that comfy office job where your arse eventually ends up the same shape and size as your swivel chair. Or maybe I’m just older now. I have three wonderful part time staff at the moment, but I am still there myself all day, every day. Despite the exhaustion and achey feet, I’d forgotten how much I enjoy it too! And people are so lovely. Whereas our first official day (and the three “dress rehearsal” days last week where we put the open sign up on the off-chance that people would actually notice) – were not amazingly busy, it was enough to feel successful. The supportive friends gradually gave way to interested Twitter followers, who in turn were joined by hopeful caffeine-hungry local office workers. Word is getting out! We’ve received so many positive comments and well wishes that I can’t help but feel crazy-confident about the whole endeavour. Our new neighbours even arrived with bunches of flowers for us! As with Wheelie Good Coffee, the response contrasts so sharply with my experiences in Darlington that I’m convinced I must be on the right track finally. That goes for everything else recently as well. I have my cafe business again, my wonderful hubby and brilliant beastling daughter, there is another Timbit daughter booting from inside my belly, my fantastic friends are all rooting for me from both sides of the atlantic, the Parents have just booked another trip back here for the summer, the sun in shining and all is right with the world! And I am very, very lucky. Miranda came home the other day saying she wants to be a farmer when she grows up. Fair enough – we’re in the right place! Saskatchewan is Canada’s bread basket apparently – a lot of agriculture happens here in the Big Flat Spaces between towns. Abundant grain elevators. Last year at the Mustard festival, we learned that Saskatchewan is the largest exporter of mustard seed in the world. And then of course, Regina has it’s own Farmers’ Market. ( awaits jokes along the lines of “how do I farm Reginas?” from Mr Chapman) It is awesome. It gets bigger every week. Something like 13,000 people visit it on a week day morning. It wins awards. Not every market vendor is actually a farmer. I don’t think the bread guy grows his own wheat, and I don’t think the pastry people grind their own flour..and as for me, um… well anyway, everything is made locally at least. All the vegetable vendors grow their produce locally, and it is all the better for it. There’s even a cheese stall with my favourite goats cheese from their goat farm, and a man selling meat from his ranch, who originated from Cumbria, England. Although I am not a farmer, the market has welcomed my coffee business with open arms and empty travel mugs. 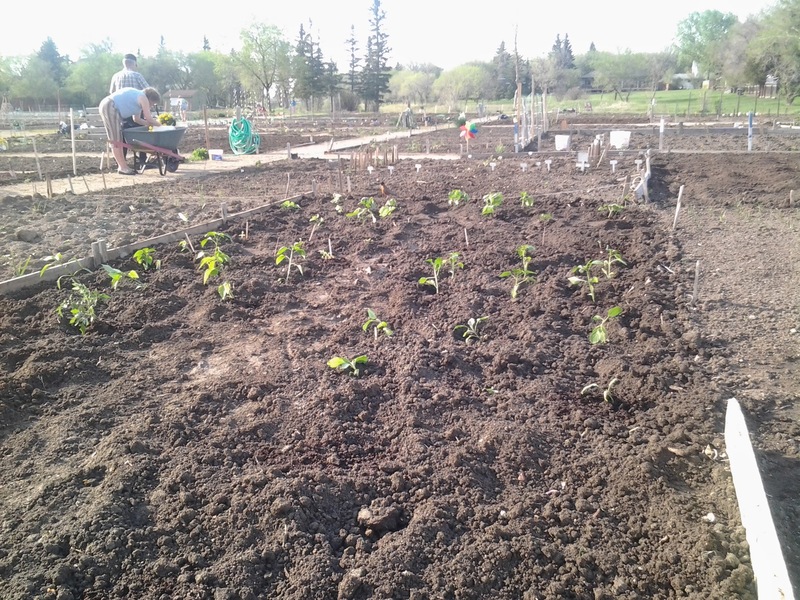 It would be seriously difficult to cultivate and farm coffee in Saskatchewan anyway. But, I brew it here, straight in front of local Saskatchewinians, and more importantly, Bill roasts it here too. I feel like we fit in. Lacking the appropriate >800m above sea level altitude, the climate that never drops below 18C and the required humidity means I can’t farm coffee here, but to my surprise, I have actually managed to grow vegetables here – and not just any vegetables, MUTANT MARROWS. Apparently courgettes and marrows are both called Zucchini in Canada, but I mean excessively large tubular green things anyway. One little project I’ve been working on when I’m not at beer club/poetry slams or either of my two jobs, is gardening. Marianne and I have been tending a small plot in the local community gardens (allotments, to UK folk), and under her tutelage, I’ve managed not to kill anything (an amazing achievement!). Our veg even survived numerous storms and the wettest summer anyone can remember. I have been eaten alive by mosquitoes down there, so I feel my blood sacrifices may have been beneficial to the mutant generation process. I should point out, that is one Mega Marrow of Many. One was so large I couldn’t get it home on my bike. I’ve made zucchini pasta sauce, zucchini gratin, stuffed zucchini, deep fried zucchini, zucchini Thai green curry, zucchini stir fry and zucchini relish. Marianne made zucchini chocolate cake too, and I even gave away seven of the buggers to people at work. And both Marianne and I still have several of them in our freezers. 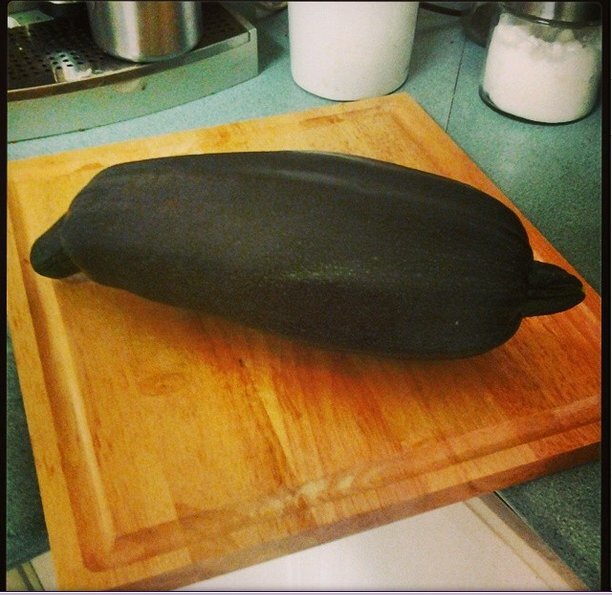 I NEVER WANT TO SEE A ZUCCHINI/MARROW/COURGETTE EVER AGAIN!!!! My neighbouring stall on the market last week was Scandinavian Sweethearts, who make amazing pickles with homegrown veg. The Scandinavian sweetheart told me she had over 300lb of cucumbers this year. I can sympathise, but then, she is intentionally growing them in bulk. Ours were… not intentionally so oversized… Mind you, it seems to be a Saskatchewan trend this year. Market Manager Ada has been spotted modelling a huge cabbage on her head. Perhaps this is what happens to you if you spend too long in the company of Regina Farmers….? In my last post, I mentioned that my favourite coffee shop in Cathedral is closing down at the end of this month. 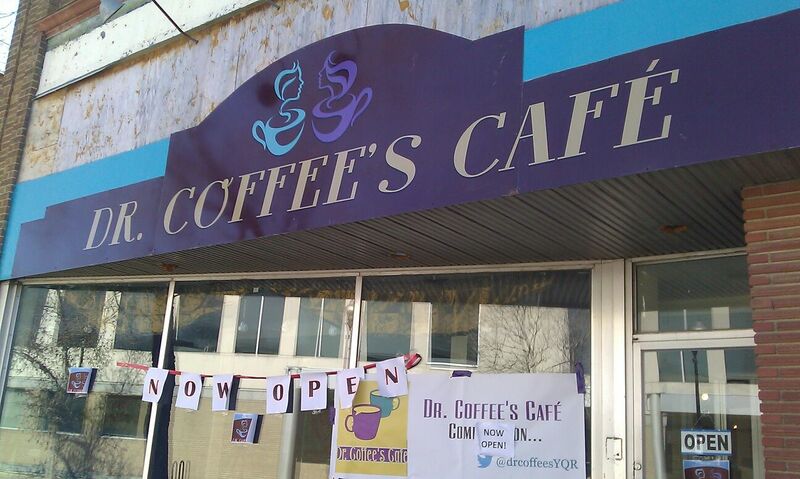 That coffee shop is of course, Roca Jacks. This makes me very sad indeed. The coffee is the best in town in my humble opinion, but more than that, the place was my first Regina landmark – we hung around in there constantly in that painful two weeks back in 2011 where Emigration Plan 1 (Kave Haz) fell apart in front of me, and where Plan 2 (13th Ave Coffee House) eventually became an option. It was where I met Tamara, my first real friend in Canada, and through her, and the coffee shop itself, I’ve met so many others. I slept on her futon for 6 months, that used to live in Roca Jacks’ basement and it now adorns our spare room. 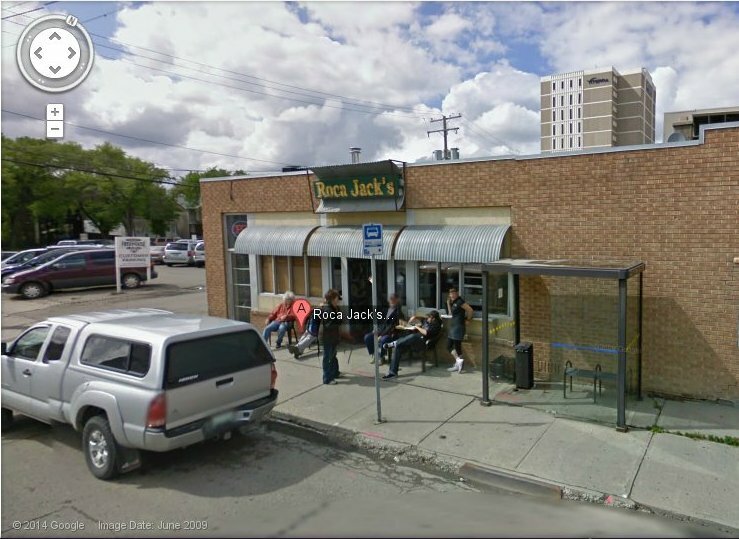 When getting to grips with Regina’s layout, I looked the place up on Google street map, only to discover that the group of regulars who sit outside it, actually feature on the map!! I persuaded Bill at Roca Jacks to roast a special blend of coffee for 13th Ave Coffee that was unique to their business, and they are still using it now, even though I left a year ago. Bill was also one of the first people to employ my coffee consultancy services. I’ve chained both Yoshi the bike and Twyla the trike up outside it, and sat in there for hours with a laptop, a friend or three, or a sleeping Miranda. Miri has danced, shouted into a fan, climbed into the coffee roaster, petted Lorena’s Daschund (another “Mr Pickles”), drunk copious amounts of hot chocolate and even mastered the toilet in there. When they first announced their closure, I immediately dreamed up wild over-ambitious plans of buying the place via crowdfunding and keeping it going as a straight-forward coffee shop (and Bill would keep the roasting side of it). I was gonna do out the basement and make more seating and even sell books in there since the book shop is also closing. I rallied the troops – my friends, the loyal Twitterers of YQR, and friend’s girlfriend’s random acquaintances on Farcebook. Sadly, my plans never materialised; although the business could have been available, the lease on the building was not, and a coffee shop without an actual shop isn’t much use. I am truly and utterly gutted by this, and I don’t think I’m alone in that feeling. But, having set my heart on coffee-ing again, I’m going to set a little something up that is not quite so financially insane. Fittingly for Cathedral, it’s going to be a rather hipster-ish coffee cart towed by my tricycle, called Wheelie Good Coffee – that link will take you to more details over on my coffee blog. I’m hoping to get it ready in time to bring coffee to the street fair at the Cathedral Arts Festival. I’ll be serving beans from Roca Jacks, of course. 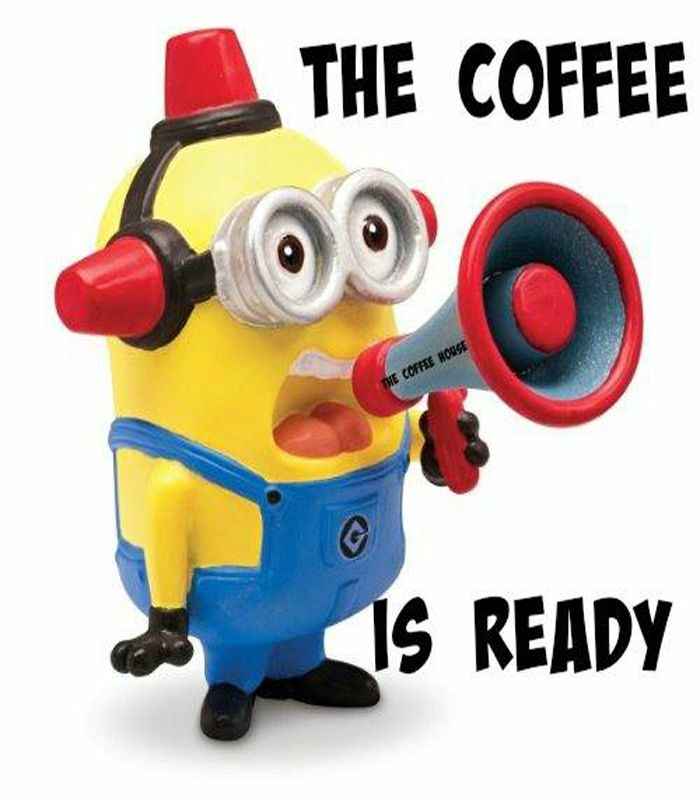 Because Coffee is important. In this case though, it is not just about the coffee; it’s about community. But it’s coffee that brings my bizarre little community together, and I will always love that. CVAF Day 6: the fastest shot in the west!! We were all warned that today would be “a zoo”, but most of the staff at the coffee house were not working there this time last year, and have never experienced the last day of the arts festival before. Given the day was pretty overcast and cold again, we all trooped in and got organised early, but didn’t really expect to be hit with that many customers so quickly and so ceaselessly!! The entirety of the Cathedral end of 13th Avenue was closed to traffic, to make way for a street fair with loads of stalls all selling things that could be classed as “arts and crafts” – and then burger vans, doughnuts, various Woo Merchants (by which I mean the “copper bracelets for rheumatism and panpipe/whale song CDs” type of stall), the beer tent and someone trying to flog sunglasses ironically. Everyone was frantically setting up around 8am, including us, as we had a tent outside serving up cookies and filter coffee whilst inside was reserved for food and espresso. I was wondering if we were going to cut down the menu or just do take out or something, but noooooooo, the poor kitchen team were trying to do everything they usually do, but at twice the speed for six times the number of customers! The coffee alone was madness, so I have the utmost respect for Mike, Ally, Arun, Rachel and above all, Ashten for coping with all the food orders. Tanneille had ground up several kilos of coffee for the filter pots and I’d weighed it all out, filling four boxes and three tubs with enough for at least 40 filter pots. We ran out within the two hours!!! Unfortunately the perculator takes 8 minutes to brew one canister of coffee, and we ended up with one person just refilling the damn pots one after the other monotonously, until we really couldn’t keep up any longer and Emma had the bright idea of filling the two litre pots with Americano – because apparently me making up huge buckets of espresso shots and boiling the kettle was quicker than waiting 8 minutes for it to filter. And, as Ashten so assertively put it, “Americano is just espresso watered down so it tastes like coffee.” I despair. By lunchtime we’d developed a system whereby someone manned the till taking orders and money, sending food orders to print in the kitchen electronically, but handwriting thousands of post-it notes with coffee orders on, which she lined up on the espresso machine, and yours truly just pulled shot after shot after shot after shot and steamed cow-fuls of milk. The post-its got more and more illegible until I was trying to make a “log calm slim late n mad lord fag” [large caramel latte with skimmed milk and a medium London Fog] In a way, I got the easy job because I didn’t actually have to talk to anyone!! If I’d been on the till, we’d have been there all night whilst people tried to figure out my accent or while I forgot soups or poisoned coeliacs with glutenous tofu or something!! The espresso machine doesn’t answer back. Nowadays, it usually does what it is told, but it certainly got a good workout today!! from 1pm to gone 3, I didn’t actually move from the square metre of space surrounding the espresso machine, and after that, it was only to put the pile of milk cartons in the recycling, and grab more cups from the shed. I even asked someone to pass me a bottle of water from the fridge two feet away at one point! I know this sounds ridiculous but I was in my element – I just completely zoned out to everything else around me and concentrated exclusively on coffee – and the day zoomed passed!! I finally noticed the time about 20 minutes before I was supposed to fetch Miranda, and panicked trying to find someone to take over…. We used over 7lb of coffee in four hours, and that was just the espresso, let alone the filter pots outside! I got some lovely compliments from the boss afterwards, if “you are not human” should be taken as compliment! I do think we all did brilliantly. Better still, Miri had a fun day with Teenage Babysitter, and apparently was no trouble at all, even when they took her round the festival. We had poutine and huge burgers and beers (well, milk) to celebrate afterwards, and when I had a shower, there was coffee grounds in the bottom of the tub – I was literally sweating the stuff from every pore!! So, top score for my first ever Cathedral Arts Festival – thoroughly enjoyed it, even if I did miss the Monday. Love this neighbourhood!! The Coffee House is not going to get posted about tonight because I am TOO TIRED! I’ve done my first full, 40 hour week this week, I got my first pay packet too, (which sadly ALL has to go on rent and/or Miri’s daycare!) and although I am completely exhausted, I am enjoying it! I think I am slowly getting the hang of the place, and familiarising myself with it. It’s just difficult getting to grips with my role there because I don’t feel yet like I can really take charge, just because I don’t know the place, or the staff well enough to do so confidently. The staff are fun and friendly though, and the customers are chatty and generous with the tips!! (A Canadian phenomenon I just cannot get used to!!) So it’s all good, and I know it will get there. I have been having a few mini adventures with coffee though, over on my other blog: drcoffee.wordpress.com. I may be “looking for patterns” slightly here, but the number 13 keeps popping up at the moment. I live on 13th Avenue, I work at 13th Avenue Coffee House (and of course it was them that finally got us out here), I found a range of gothy clothes here called Lucky 13, Miri was born on 13th June, and Carl and I have been together 13 years this year – the year we finally emigrated. And today I made a tower of 13 coffee pucks before it fell over!! 🙂 Not so unlucky for me I reckon! !